MANCHESTER – 22nd January 2018: The latest effort by FMCG firms to get on board with consumers’ changing breakfast habits is the subject of this month’s Innovation Insight. Under the microscope is a launch that melds fuel-rich rice with the convenience of pouch packaging for a new kind of breakfast experience – Forbidden Brekky Rice. 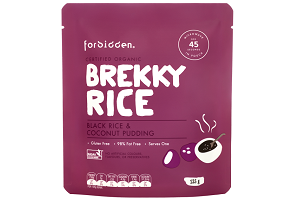 Promoted as “an easy way to kick off the day”, Forbidden Brekky Rice from Australian firm Forbidden Foods takes a traditional dessert – rice pudding – and repositions it as a healthy yet sustaining hot breakfast food. Aligned to a growing trend for convenient ‘heat and eat’ products that typically target busy professionals, Forbidden Brekky Rice comes in a pouch that heats up in less than a minute in the microwave, making it suitable for out-of-home use. Fashionable functional ingredients are the order of the day, with the primary ingredient of black rice providing “a subtle sweetness”, complemented by coconut for a “velvet mouth feel”. Tapping into the dietary zeitgeist, the product is also claimed to be gluten and dairy free, low in fat and sugar and suitable for vegans. Forbidden Brekky Rice can be seen as the logical extension of the revival of hot cereals as a convenient breakfast food. Rice desserts could be shaping up for a rebirth as a sustaining morning snack, delivering the ‘fuel’, comfort, convenience and superfood benefits that are now headlining much innovation in the breakfast space. 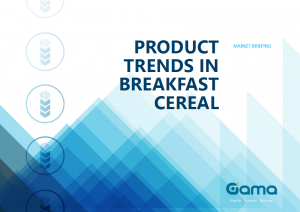 Take a more informed approach to product strategy, increase profitability and reduce costly mistakes with Gama Compass, Gama’s premium subscription service for the FMCG sector. Developed with the industry’s leading names, Gama Compass offers powerful insights that allow you to unlock new opportunities and streamline your innovation pipeline. Gama is a global provider of business information and services specializing in product innovation and international trade. Through our worldwide network of over 100 experts in more than 46 countries, we offer high-quality news, research, analysis and partnering services. We deliver actionable insights, enabling you to make more informed decisions and supporting you to unlock new business opportunities. Tom Warden, Gama editorial director, is available for comment. To arrange an interview please contact +44 161 818 8700 or info@gamaconsumer.com.